Dr. Sampa Kundu is Research Assistant at IDSA Click here for detailed profile. The electoral success and assumption of office by Daw Suu and her party has resulted in huge expectations, leading to the single-most crucial question: would the five-year term of the government be sufficient to meet all the expectations? The answer lies in the capacity and the capability of the new government to deliver on the promises made to the people; the approach of the new leadership towards resolving several continuing as well as emerging issues of concern, and finally, the future role of the Tatmadaw (the military) in politics and government. The crux of the issue is that Myanmar still has many hurdles to overcome before it completes the journey towards democratic transition. 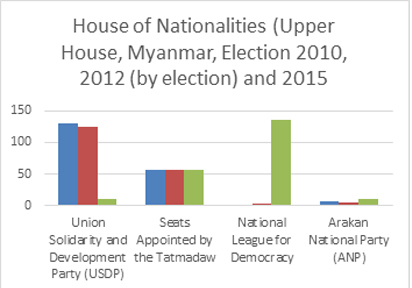 This backgrounder offers an overview of the two most challenging concerns for Myanmar’s democracy – ethnic unrest and economic hardships – and how the new government is planning to address these issues in particular and also more generally the influence of the Tatmadaw in politics.2 It begins with a brief discussion on the trajectory of Myanmar’s transition to democracy. Next, it details the two crucial challenges of ethnic unrest and economic hardships facing Myanmar. And, finally, it draws some relevant references on the changes in Myanmar’s relations with the major global powers under Suu Kyi. The Tatmadaw still wields considerable power in Myanmar. It derives its influence from the instrumental role it had played in Myanmar’s struggle for independence. It was again the Tatmadaw that chose the path towards democratic transition. By the early 2000s and during the referendum held on the 2008 Constitution, General Than Shwe’s junta made it clear that Myanmar’s democratic transition would be a slow but steady process. Than Shwe’s so-called road map to democracy was intended to reaffirm the military’s role in the government and ensure a measured shift to democracy. The nominally civilian government under Thein Sein practised restrained democratic values and rules. Thein Sein was definitely considered a successful leader as it was during his leadership that many international sanctions were lifted and Myanmar, for the first time, hosted the ASEAN Summit and related meetings. Under his leadership, Myanmar not only reduced its dependence on China but also made sincere attempts to rejuvenate its relations with other countries in the region. The 2008 Constitution enables the military to retain a measure of power by reserving 25 per cent of seats in parliament to the Tatmadaw.3 Besides, Section 436 of the 2008 Constitution gives the military a veto power over constitutional changes/amendments. And Section 59(f) restricts Daw Suu from becoming the president. It was only natural that President U Htin Kyaw spoke about the “emergence of a constitution that will lead to effectuation of a democratic, federal union” in his inaugural speech.5 While it is not clear from his inaugural speech whether he is suggesting the writing of a new constitution or amending the existing one to complete the transition towards democracy and ensure federalism, one of the NLD’s legal advisers, U Ko Ni, and a few Myanmarese political analysts like U Yan Myo Thein believe that the NLD has no option but to call for a national referendum aimed at drafting a new constitution.6 Their argument sounds logical not only because the NLD, as an opposition, tried, albeit in vain, to amend the constitution twice, but also because drafting a new constitution in line with the political principles held by Daw Suu and her party does not appear to be difficult as they enjoy a simple majority in parliament with 58 per cent of the seats (See Graph 1 and 2). In fact, the NLD’s decisive victory in the election should be enough to foster confidence that the new government will seek to draft a new constitution.7 Additionally, Daw Suu now shares good relations with some officials who held influential positions in the military-backed government led by Thein Sein, including U Zaw Htay (director in the former president’s office, who played a significant role in the present government’s transition team) and U Thura Shwe Mann.8 In fact, before her party acceded to power, Daw Suu had met several representatives of the previous government to discuss various issues including the possibility of her becoming the president. However, the other side of the coin tells another story. The Tatmadaw still has at least one reason to block the NLD’s attempts to either amend the existing constitution or draft a new one, namely, the wish to retain political influence through the legitimate means afforded by the existing constitution. In fact, to do so, the Tatmadaw may raise doubts on the administrative capacity of the non-military government officials who had been made to obey the high ranking army officers for three decades when the State Law and Order Restoration Council (SLORC- 1988-1997) and State Peace and Development Council (SPDC- 1997-2011) ruled the country. During this period, it was repeatedly mentioned that the military needs to administer and govern Burma/Myanmar because of the unpreparedness of the common people to take up the responsibility, which gave a pretext to the military to preserve power for itself through the constitution. Suu Kyi and the NLD-led government have brought some hope for the ethnic minorities in Myanmar, probably except the Rohingyas whom Daw Suu, like the majority Burmans, considers as ‘Bengali’ as evident from her actions so far. While the selection of Henry Van Thio, an ethnic Chin, as one of the vice presidents was one of her steps towards giving equal rights and voice to the ethnic minorities, her request to the US Ambassador to Myanmar, Scot Merciel, not to use the word Rohingyas was perhaps a blow to her image of a champion of freedom and democracy. The agriculture sector of Myanmar requires special mention here. Almost 70 per cent of the country’s labour force is employed in the agriculture sector, which contributes almost 34 per cent to the GDP.17 Unfortunately, once recognised as the ‘rice bowl of Asia’, Myanmar’s agriculture sector now suffers from myriad problems including lack of land reforms, dearth of an adequate institutional loan system, low investment and low productivity. The electoral manifesto of the NLD had mentioned implementation of land reforms and development of the agriculture sector as priority areas. However, the significant presence of the military elite in the government and the existing bureaucracy which had been working under the leadership of Tatmadaw for five decades may make the job of the NLD a more complicated one. Myanmar under the de-facto leadership of Daw Suu may also go a few extra miles to re-develop relations with China, which had seen some difficulties under Thein Sein. A committee under Daw Suu has already sent a green signal to Chinese state-run company, Wanbao, to re-start copper-mining in Monywa, a project that was halted under Thein Sein. China’s Foreign Minister Wang Yi was among the first few foreign dignitaries to visit Nay Pyi Taw immediately after the NLD-led government came to power. At a press conference, Mr. Wang Yi appreciated the policy of the new Myanmar government towards China. He also expressed hope for a thrust in Chinese investments in Myanmar which may see a growth up to USD 3.3 Billion in 2016, from USD 56 million in 2014.20 For Daw Suu, henceforth, the primary challenge would be to maintain a balance between the West and its allies, on the one hand, and China, on the other, as at this critical juncture of transformation and transition, Myanmar cannot afford to lose the chance of nurturing relations with any major power, which, in turn, is likely to fetch more FDI and trade to Myanmar. So far, the electoral victory of the NLD has been seen with a lot of optimism. Definitely, the victory was celebrated as a people’s victory. However, the difficulties for the new government are too real to be ignored. How the NLD-led government will manage its relations with the military, the minority ethnic groups and how it will face the daunting economic challenges will define newly democratic Myanmar. Additionally, dealing with the global powers would also require major attention and pragmatism. On a positive note, it can be said that Suu Kyi’s constant engagement with the common people of Myanmar as well as with international leaders is expected to further strengthen the NLD Government and help Myanmar chart a new democratic future. Source: “Myanmar in Graphics, An Unfinished Peace,” The Economist, March 15, 2016 at http://www.economist.com/blogs/graphicdetail/2016/03/myanmar-graphics (Accessed June 3, 2016). 1. Some glimpses of the transition to democracy were seen even in the 2000s, under the leadership of General Than Shwe. 2. One reason for taking up these two challenges and leaving out others such as corruption, resource curse, poor governance, trafficking and illegal migration, etc. is that U Htin Kyaw himself identified these issues as the priorities of the government in his inaugural speech as president. 3. 166 military representatives are serving in the Union Parliament; out of these, 107 are serving officials who held seats in the previous legislature as well. 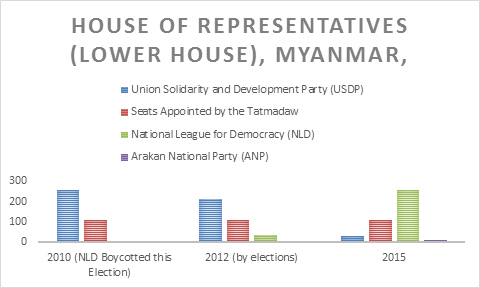 This includes 17 officers in Pyithu Hluttaw (Lower House) and 11 in Amyotha Hluttaw (Upper House), who have been sitting in parliament for the last five years. 4. Ei Toe Lwin, “NLD could draft new constitution,” Myanmar Times, April 22, 2016, at http://www.mmtimes.com/index.php/national-news/nay-pyi-taw/19910-nld-cou... (Accessed July 20, 2016). 5. “President U Htin Kyaw: The constitution to be in accord with democratic norms,” The Republic of the Union of Myanmar, date not specified, at http://www.president-office.gov.mm/en/?q=briefing-room/speeches-and-remarks/2016/05/27/id-6358 (Accessed July 20, 2016). 8. Wai Moe and Thomas Fuller, “Myanmar Talks Could Open Door to Presidency for Aung San Suu Kyi,” The New York Times, February 5, 2016, at http://www.nytimes.com/2016/02/06/world/asia/myanmar-military-aung-san-suu-kyi-president.html?smid=tw-share&_r=3 (Accessed June 06, 2016). 9. Renaud Egreteau, “How powerless are Myanmar's military legislators?,” Nikkei Asian Review, June 5, 2016, at http://asia.nikkei.com/Viewpoints/Viewpoints/Renaud-Egreteau-How-powerless-are-Myanmar-s-military-legislators?page=1 (Accessed June 06, 2016); “Military MPs slam bill to create 'state counsellor' role,” Myanmar Times, April 1, 2016, at http://www.mmtimes.com/index.php/national-news/19804-military-mps-slam-bill-to-create-state-counsellor-role.html (Accessed July 26, 2016). 10. “Suu Kyi plans Myanmar reconciliation government with role 'above president,” The Guardian, November 5, 2015, at http://www.theguardian.com/world/2015/nov/05/suu-kyi-plans-myanmar-reconciliation-government-with-role-above-president (Accessed June 6, 2016). 11. Strong ethnic rebel groups like the Kachin Independence Army, Ta’ang National Army, The Kokang group, and United Wa State Army have not signed the nation-wide Ceasefire Agreement. The Karen National Union, Karenni National Progress Party, Chin National Front, New Mon State Party, Pao National Liberal Organisation and Shan State Army (North) were some of the groups that had signed the ceasefire agreement with Thein Sein. 12. “New Name for Peace Center,” The Republic of the Union of Myanmar President Office, May 17, 2016, at http://www.president-office.gov.mm/en/?q=administration/state-counselor/id-6320 (Accessed June 01, 2016); “Aung San Suu Kyi to Lead Stability And Development Committee For Myanmar’s Rakhine State,” Radio Free Asia, May 31, 2016, at http://www.rfa.org/english/news/myanmar/aung-san-suu-kyi-to-lead-stability-and-development-committee-for-myanmars-rakhine-state-05312016163157.html (Accessed June 01, 2016); and “Peace process must focus on all stakeholders: State Counsellor,” The Republic of the Union of Myanmar President Office, May 9, 2016, at http://www.president-office.gov.mm/en/?q=administration/state-counselor/id-6301 (Accessed June 1, 2016). 13. “Myanmar Economic Monitor,” May 2016, The World Bank, at http://www.worldbank.org/en/country/myanmar/publication/myanmar-economic-monitor-may-2016, (Accessed June 2, 2016). 14. “Myanmar’s Economy, The Burma Road,” The Economist, April 2, 2016 at http://www.economist.com/news/finance-and-economics/21695944-long-and-painful-journey-awaits-myanmars-new-government-burma-road (Accessed June 3, 2016). 16. The World Bank, Note 13. 17. The Economist, Note 14. 18. David Sanger, “John Kerry and Aung San Suu Kyi: A Milestone Meeting in Myanmar, Tempered by Questions,” The New York Times, May 22, 2016, at http://www.nytimes.com/2016/05/23/world/asia/john-kerry-myanmar-aung-san-suu-kyi.html (Accessed June 3, 2016). 20. Shibani Mahtani and Myo, “China Woos Suu Kyi, Seeking a Fresh Start in Myanmar,” The Wall Street Journal, June 9, 2016, at http://www.wsj.com/articles/china-woos-aung-san-suu-kyi-seeking-a-fresh-start-in-myanmar-1465527182 (Accessed July 20, 2016). 21. Nivedita Dash, “Suu Kyi: Transparency essential for India's hot-pursuit missions in Myanmar,” India Today, October 7, 2015, at http://indiatoday.intoday.in/story/indian-democracy-a-lesson-for-myanmar-to-follow-aung-san-suu-kyi/1/492860.html (Accessed July 26, 2016).